Just yesterday one of my dear friends and fellow practitioners in another city called me to do a medical intuitive reading to find out why one of their long-term clients is not losing weight. The individual in question takes a ton of supplements and exercises regularly but has had no change in her body composition. My friend told me that her client does have a lot of aches and pains, and she had wondered if that person had fibromyalgia. “A for effort,” I said. “But that’s not why she is not losing weight. I told my friend to get her client to read the book Radical Forgiveness by Colin Tipping. I told her to go to my website, www.totalfitness.net, and check out the free files. There is a worksheet there you can download for free to help you work through to forgiveness. That was partly why I knew that if she wasn’t working so hard, she would have fibromyalgia, because the fibromyalgia patients are stuck in the sympathetic part of their nervous system and have chronically tight muscles. If a person is stuck in fight or flight, their endocrine system will be chronically pumping out the stress hormone cortisol, which will keep their metabolism out of balance. One of the primary effects of cortisol is to raise blood sugar. In plain English, you can not heal a damaged metabolism until and unless you stop being chronically overworked and overstressed. It’s not a matter of joining another boot camp. It’s a matter of calming down, period, not working morning noon and night and learning how to live your life at a more relaxed and peaceful pace. As I was doing the medical intuitive reading, I tried to figure out who this person needed to forgive. I have not met this person, and I was doing the reading on behalf of my friend, who has been coaching this client for years. “It’s not her mother. It’s not her father – she is just chronically angry with everybody and everything,” I said. Five minutes of anger will raise your cortisol level for 6 hours. Once you know how bad cortisol is for your metabolism, you will begin to understand why people who have not yet learned how to forgive can have weight problems. Every emotion you experience affects specific organs. Even if you do not acknowledge how you feel, the biochemical effect is still there. Emotions can shut down any organ, which is why approaches that deal with only the physical body may not be fully effective. You can eat well, take great supplements and exercise, but if you don’t deal with your emotions, you will probably not look the way you would really like to look. Paradoxically, a friend here in Atlanta had also asked me recently about why she wasn’t losing weight. She had been exercising every day and was feeling more toned but did not see a change on the scale. The good news is that she is onto herself – she has been working on releasing her resentment towards her husband. “It’s your gallbladder,” I told my friend after doing a medical intuitive reading. We then discussed a number of changes she can make, but the most important is to practice forgiveness. If you do not learn how to forgive, those stuck emotions affect the functioning of your liver and gallbladder. If your liver and gallbladder don’t work correctly, your body will not be able to process fat very well. 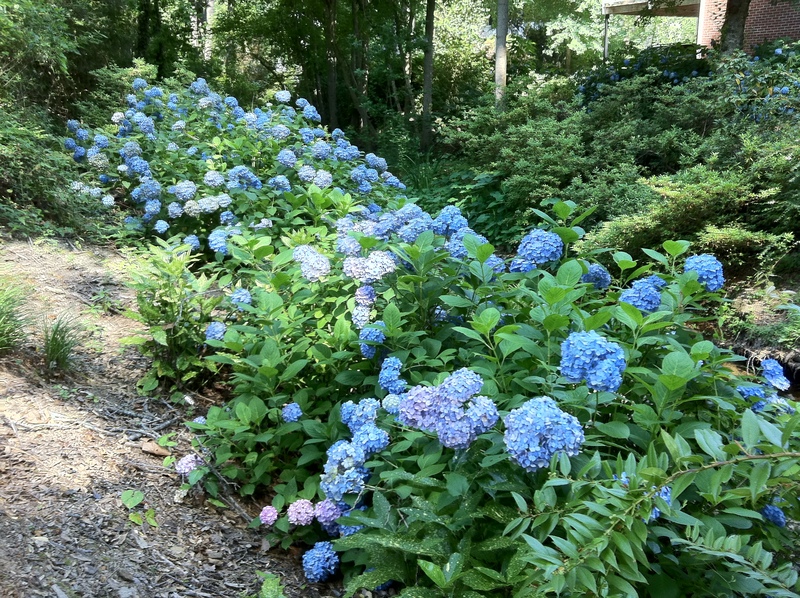 Photo: Hydrangeas that I see when I walk my dog Belle around the circle next to my home.